In 1969 eight talented African American athletes risked their athletic scholarships and likely their NFL careers by demanding an end to institutional racism at Syracuse University. Dubbed the Syracuse Eight, they boycotted and petitioned for equal treatment as white players at the school and on the field. 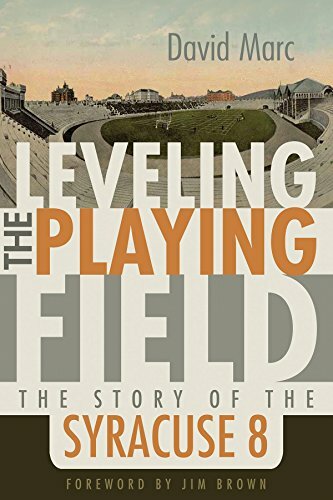 Their actions proved to be the game changer in the insular world of college football, and their stories are finally fully told in David Marc’s penetrating bio-history Leveling the Playing Field. “He made fools of them in front of the administration and spoke about them to the newspapers like they were a bunch of wild thugs.” is how former star player Duane “Spoon” Walker describes Ben Schwartzwalder, the otherwise “beloved” head football coach at SU, who maintained a calculated and often stealthy oppression of black players during his 24-year tenure . The story of the Syracuse Eight starts with the establishment of the school by a Methodist abolitionist in 1850 and the school’s early inclusion of African Americans. By the 1930s, its mission of equality was deeply compromised by the racial divides both in academia and in the country. All of the Syracuse Eight players in fact chose the school based on its reputation, but found out the school’s public image of being integrated was far from the reality. Most passed up scholarship offers from other institutions including Harvard and Yale, because they thought Syracuse was a better environment academically for blacks and black athletes. Such legendary black athletes as Wilmeth Sidat-Singh, Ernie Davis, and Jim Brown had made their names at SU. Syracuse teams had agreements with schools south of the Mason-Dixon line that blacks and whites would not be permitted to be on the same field. In the case of Wilmeth Sadit-Singh, one of the SU Orange’s most talented athlete in the 30s, he was portrayed falsely as a student from India or, as he was called in the press, a “Hindu” footballer. When he was eventually identified as African American, he was benched. Even after WWII, Marc chronicles the official and unofficial manifestations of racism in his chapter The Myth of Progress. Head coaches Lew Andreas and his successor Ben Schwartzwalder refused to start a black player as a quarterback because the prevailing opinion was that they wouldn’t be smart enough and that it wouldn’t be acceptable that a black player would be leading a team of white players. Still, Ernie Davis, the first African American Heisman trophy winner advanced, with key support from nonracist coaches who found ways to break down the barriers, however tentative the results. Often an advancement would seemingly end the matter, but instead result in a backlash with Schwartzwalder and his cronies spitefully maintaining the racist status quo. In deflecting his own motives, Schwartzwalder somehow maintained the public appearance of being fair and inclusive. By the time Hall of Fame great Jim Brown came to SU in the 50s, he was such a gifted athlete in several sports—lacrosse, basketball, and a nationally ranked decathlete—and his achievements were so great he couldn't be held back as he was becoming a national sports celebrity. The players—Gregory Allen, Richard Tyrone Bulls, Dana Jon Harrell, John Lobon, Clarence Bucky McGill, Abdullah Alif Muhammad, Duane Walker and Ronald Womack, who was previously kicked out by Schwartzwalder—all get to speak their truths to power in the second half of the book from Marc’s transcribed interviews with them, recounting their stories and corroborating all of Marc’s research in personal detail. One member of the team, John Godbolt, is the only missing voice, even though Marc tried to contact him only to find out that he had died tragically just months before. The players transcended the oppression at Syracuse, all getting degrees and excelling in other fields, many as civic leaders. In 2006, they were all invited back to be honored for their activism at Syracuse as well as to receive an official apology by the university.